I've uploaded another video tutorial. 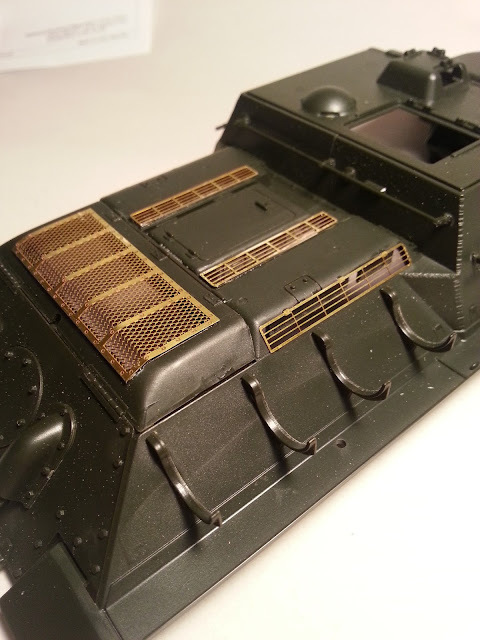 This time it is about how to use photo etched metal detail to upgrade your models. It's a bit of a leap of faith the first time you use photo etch. It's expensive to purchase, and it's daunting to look at the cryptic instructions and think "how the hell am I supposed to bend that into that shape?" This video is aimed at the beginner who has questions on how to begin using photo etch. As always, if you have any questions, suggestions or feedback, please contact me. I'm all ears. Video link: Beginner's guide on how to use photoetch metal on models. The end result: photo etched metal grills on my SU-122. I'll show you how to do this in my video tutorial.